Hillmer, Norman and Danny Kucharsky. "Ed Schreyer". The Canadian Encyclopedia, 20 September 2017, Historica Canada. https://www.thecanadianencyclopedia.ca/en/article/edward-richard-schreyer. Accessed 19 April 2019. Edward Richard Schreyer, PC, CC, CMM, teacher, politician, diplomat, premier of Manitoba 1969-1977, governor general of Canada 1979-1984 (born 21 December 1935 in Beausejour, MB). Schreyer was the first New Democrat to form a government anywhere in Canada. He was also the first Manitoban to become governor general. In that post, Schreyer was a strong advocate of bilingualism, the environment and women’s equality, and sought to make Rideau Hall more accessible to Canadians. 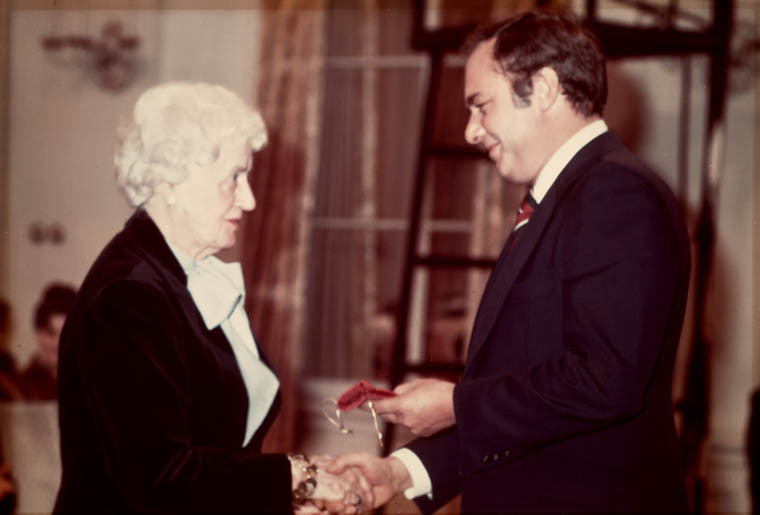 Th\u00e8rése Casgrain receives the Governor General's award for the Persons Case, from Governor General Ed Schreyer in 1979. Ed Schreyer was born on 21 December 1935 in the town of Beausejour, in southern Manitoba, one of six children of parents John and Elizabeth Schreyer (née Gottfried). Ed grew up on the family farm in the wake of the Great Depression. He went to school at the tiny Cromwell Public School, and at Beausejour Collegiate. Schreyer was one of only a small handful of students in his rural community to attend university. He enrolled at United College and St. John’s College at the University of Manitoba, where he earned a bachelor of pedagogy in 1959. He also received a bachelor of education in 1962, a master of arts in international relations and a second masters in economics in 1963. During his university studies, Schreyer returned to his old high school, teaching at Beausejour Collegiate between 1956 and 1967. During the same period he also taught international relations at St. Paul's College of the University of Manitoba from 1962 to 1965. When he was 18, Schreyer joined the Co-operative Commonwealth Federation (CCF), a precursor of the New Democratic Party (NDP). In 1957 he worked as campaign manager for Jake Schulz, who was elected a CCF member of Parliament from Manitoba in that year's federal election. Three years later Schreyer married Schulz's daughter Lily. Together they would have four children. Meanwhile, Schreyer was successfully pursuing his own political ambitions. 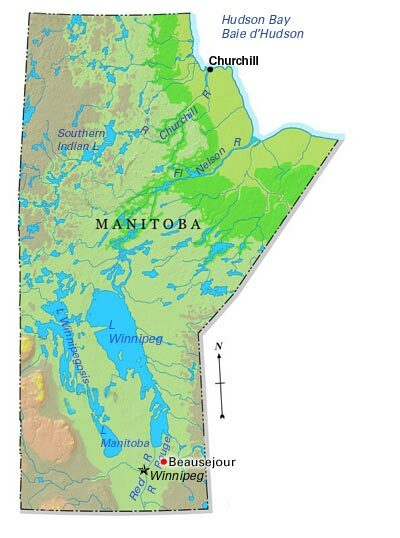 In 1958, at age 22, he became the youngest member of the Manitoba legislature, representing the rural riding of Brokenhead which included his family's home district. Schreyer served for seven years as an opposition MLA, first as a CCF and then an NDP member. At 29, he entered the federal arena, becoming the NDP member of Parliament for the riding of Springfield in 1965 federal election. He was re-elected in 1968, this time as the member for Selkirk. As his wife Lily would say of the Schreyers' time in Ottawa: "When we got there, Ed didn't like it. We never went anywhere . . . We missed our friends. I think I could have adjusted, but Ed's still basically a small-town boy." In 1969, in the midst of his second term as an MP, Schreyer was persuaded to return to Manitoba to take up the leadership of the provincial NDP. He easily won that contest and was immediately thrust into a provincial election campaign called by the long-governing Conservatives. Schreyer was a compelling figure for Manitoba voters in the age of Trudeaumania. Like Prime Minister Pierre Trudeau, he was young, energetic and emblematic of a new generation of leaders. Schreyer was also politically moderate despite his socialist roots (he was regarded as too conservative by some in his own party). He appealed to both urban and rural voters, and many Liberals across Manitoba gave him their support. This was enough to vault Schreyer into power – making him, at 34, the youngest premier in Manitoba's history – and giving the NDP its first turn at government in Canada. Schreyer had a minority of 28 seats in the 57-seat legislature. This soon became a slim majority when a Liberal MLA agreed to join the Schreyer Cabinet. Schreyer and the NDP were re-elected in 1973 with a majority government of 31 seats. He ultimately served 100 months as premier. His administration was moderate, honest and mildly progressive. It enacted regulations requiring environmental impact assessments for major development projects. It also introduced public automobile insurance, and eliminated provincial health care premiums. In the 1977 election, Schreyer's government was defeated by the Conservatives under Sterling Lyon, who won 33 seats to the NDP's 23. Schreyer remained in the legislature as leader of the Opposition until 1979, when he resigned to take up his appointment by the Queen (upon Prime Minister Trudeau's recommendation) as governor general. At age 43, Schreyer was the youngest governor general since Lord Lorne in 1878 (33 years old) and Lord Lansdowne in 1883 (38 years old). 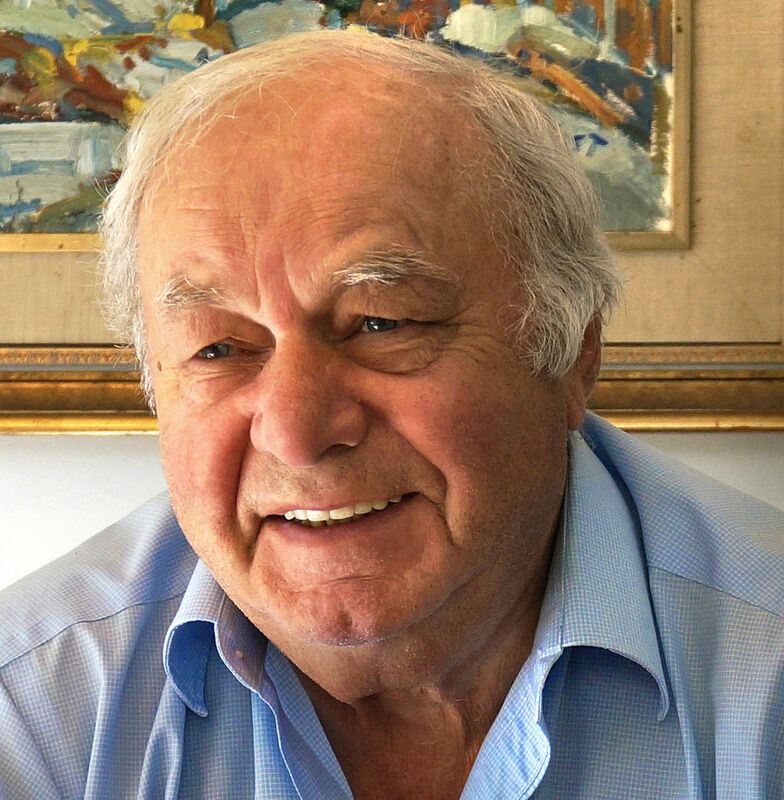 As a supporter of bilingualism and strong central government, he and Trudeau got along well. However, Schreyer was not well-suited to the traditionally staid, ceremonial role he found himself in as the Queen's representative. Instead, he was determined to speak his mind and to democratize the office of governor general. He and his popular wife made their official residence at Rideau Hall more accessible to ordinary Canadians. They also travelled the country extensively. But a governor general's words, Schreyer discovered, were easily misunderstood and he was forced to tailor his speeches accordingly, in order to be seen as strictly non-political and non-partisan. The stiff, earnest public manner required of his office conflicted with Schreyer's desire to be open and friendly, and made him an easy media target. 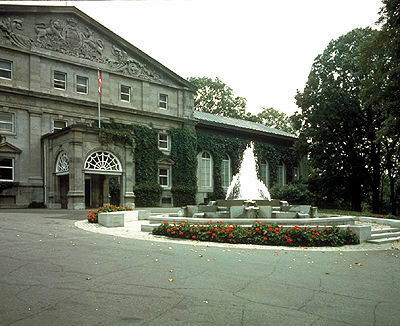 Residence of the Governor General (courtesy NCC). During his term at Rideau Hall, Schreyer advocated for bilingualism, environmental protection and the equality of women. In 1979, he established the Governor General's Award in Commemoration of the Persons Case, which honours Canadians who advance gender equality, and in 1981 he created the Governor General's Conservation Awards. Schreyer also instituted the first Governor General's Canadian Study Conference, in 1983. Now known as the Governor General’s Canadian Leadership Conference, the event brings together emerging Canadian leaders. In September 1980, Schreyer made a special trip to Port Coquitlam, British Columbia to appoint Terry Fox a Companion of the Order of Canada. Weeks earlier, Fox had been forced to abandon his Marathon of Hope run across Canada, when his cancer returned. 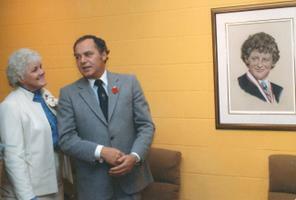 Terry Fox's mother Betty, with Governor General Ed Schreyer at the Terry Fox Canadian Youth Centre in Ottawa in 1982. Schreyer sparked a minor political controversy when he suggested that he might have dissolved Parliament in 1981-1982, if Trudeau had triggered a constitutional crisis by attempting to patriate the Constitution unilaterally, without the support of the provinces. Ultimately, Trudeau won enough provincial support to patriate the Constitution from Britain, within the boundaries set out by the Supreme Court. In 1984, at the end of his term as governor general, Schreyer was named Canadian high commissioner to Australia, Papua New Guinea and the Solomon Islands and ambassador to Vanuatu. In February 1988 he returned to Canada as a private citizen. He re-entered academic life, teaching at universities in British Columbia and Manitoba. He served as a councillor for the Canada West Foundation and as a founding Member of the Winnipeg Library Foundation Inc. He was involved in the Sierra Legal Defence Fund and Habitat for Humanity, and served as chancellor of Brandon University from 2002 to 2008. In 2005, he attempted a return to politics as the federal NDP candidate in the Manitoba riding of Selkirk-Interlake. But Schreyer lost to the Conservative incumbent in the 2006 federal election by more than 5,000 votes. Ed Schreyer, former premier of Manitoba and governor general of Canada, photographed in his 70s.